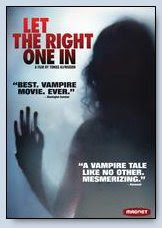 Vampires are all the rage these days, and Sweden has jumped on the bandwagon with the film Let the Right One In. This is a tale told from the perspective of a 12 year old boy named Oskar. Bullied at school and ignored at home, Oskar is receptive to the friendly advances made by the strange new girl next door, Eli. Eli doesn't wear shoes or coats, even though it's the middle of winter. She also doesn't go to school. None of these facts bother Oskar. He eventually teaches Eli Morse code so that they can communicate by tapping on the walls. Eventually, Oskar works out that Eli is a vampire and just as much of an outcast as he is. There is an adult that lives with Eli (murdering people to supply her with blood), but their relationship is never really explained. Some, but not all, of the vampire folklore elements are confirmed in this film. Eli has to be protected from bright sunlight. She also has to be "invited in" or there will be dire consequences (for the vampire). There was no mention of a dislike of garlic or turning into a bat, although Eli did mention that she moved from place to place by "flying." The most bizarre aspect of the film was the dislike that cats have for vampires. I'll admit that I'm not up on my vampire history, but what is the deal with vampires and cats? There are numerous cats in this film who all instantly recognize vampires and are driven to immediately fling themselves on the offending creatures. Now, honestly, can anyone see a cat behaving this way? If there were really a sudden invasion of vampires, I doubt my cats could even be bothered to wake up and notice it. If they did happen to encounter a vampire, I'm sure their strategy would be to hide under the bed! Still, cats have saved humanity before (Bubonic plague, anyone? ), so I guess it's only natural that they should continue to take their responsibilities seriously. After all, if humans were wiped out, who would open the tuna cans??? All in all, the film had some gory moments, but it was basically a "wish fulfillment" film for teens. Adults are clueless, or absent, or exist merely to serve the needs of the kids in the film. Bullies exist, but they eventually are dealt with severely. You can even leave your miserable surroundings and head off into the sunset if things get too bad. There were plenty of head-scratching moments, but to paraphrase someone over at the IMDB, "Expecting logic from a film about vampires is asking too much."